Taylor’s Motivation Theory, or Scientific Management, was one of the first theories of motivation in the workplace. Have you ever tried to boost the productivity of your team, but failed? Perhaps you’ve given a rousing speech or explained how important it is that the company hits its targets for the year? Boosting your team’s motivation and productivity can sometimes feel like a black art. And it can be frustrating when you try and fail to boost your team’s motivation. But it need not be this way. Motivation theories can be helpful in giving you research-based tools and models to use when attempting to raise the performance of your team. Frederick Winslow Taylor was an Americal mechanical engineer who lived from 1856 to 1915. He brought an engineer’s viewpoint to the world of workplace productivity and applied engineering principles to the factory floor. He was the first management consultant and the first to look at work and productivity scientifically. He is known as the father of Scientific Management and the efficiency movement. 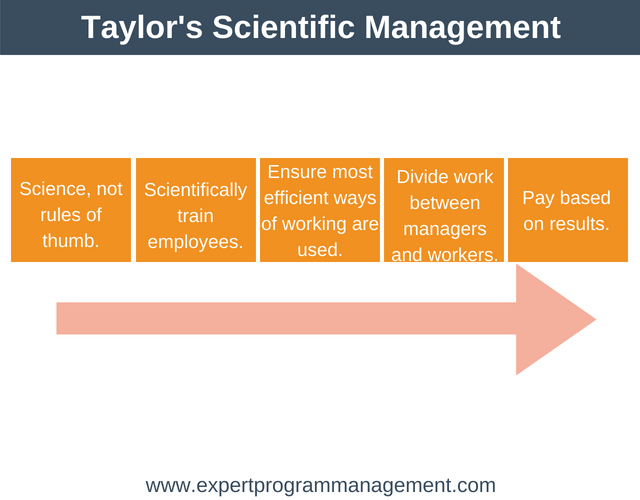 Taylor’s Scientific Management attempts to find the most efficient way of performing any job. He believed that there were universal laws which governed efficiency and that these laws were independent of human judgment. The goal of Scientific Management was to find this “one best way” of doing things as efficiently as possible. …what the workmen want from employers beyond anything else is higher wages: what employers want from workmen most of all is low labor costs in manufacture. In our scheme, we do not ask the initiative of our men. We do not want any initiative. All we want of them is to obey the orders we give them, do what we say, and do it quick. Workers don’t usually enjoy work. Because of this, they need to be monitored and controlled closely. Essentially, Taylor believed that employees had a natural tendency to take it easy of slack off whenever they could. He called this natural soldiering. To help with this, managers should break down each employee’s job into more manageable, bite-sized tasks. Training should be given so that all employees perform these tasks in a standard way. Workers should be paid based on how much they produce (piece rate). This will create a win-win situation. Workers are incentivized to work hard to earn more and the businesses production is as efficient as it can be (profits are maximized). 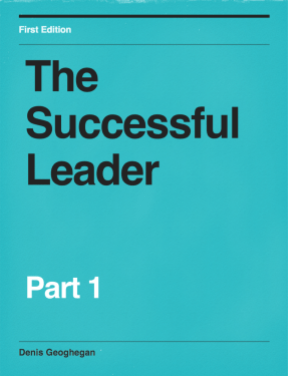 Since Taylor’s Motivation Theory is based on managers telling employees what to do, it is closely related to an autocratic style of leadership. It is also closely related to Douglas McGregor’s Theory X model of management, where it is assumed that employees are fundamentally lazy and unmotivated. Taylor’s work heavily influenced production methods at the start of the 20th century. It formed the foundation upon which Henry Ford introduced his mass-production techniques to the production of cars. Amazon: Pay certain warehouse staff using a piece rate basis according to how productive they are. In fact, Amazon is even using a wrist-based tracking system to monitor staff. You can read more about this here. McDonald’s: Every McDonalds across the globe looks the same, and the instructions to create a burger are exactly the same in every branch across the globe. Even the process of mopping the floor is exactly the same across the globe. This breaking down jobs into bite-sized chunks and then describing the most efficient way to do that job is an example of Taylorism in use today. 1. Science, not rules of thumb. Rather than doing things how they’ve always been done, Taylor wanted each job to be studied scientifically to identify the most efficient way to do that job. Taylor advocated using time and motion studies as the way to do this. This often involved looking at the most efficient workers to identify why they were so efficient. The ultimate aim is to describe in a repeatable way how to do the job in the most efficient manner. That way, everyone in the organization doing this job can be trained to do it in the most efficient way. Don’t allow employees to train themselves. Instead, each employee should be taught exactly how each task should be performed. Taylor didn’t want employees thinking for themselves, he simply wanted a simple task performed as quickly (as efficiently) as possible. In a nutshell, workers should be paid for doing, not thinking. 3. Ensure most efficient ways of working are used. Monitor: Monitor worker production to ensure that they are efficient. Cooperate: Work with employees to retrain and recalibrate them, so that they are exactly following the most efficient way to perform their job. One consequence of this was that organizational structures had to change. Rather than a factory having one single foreman, Taylor advocated several, each one specifically focused on efficiency for a particular area of the factory. The aim of this step is to maximize production, unlike in situations where ‘soldiering’ occurs. That is situations where workers naturally slack off because they are not being monitored. 4. Divide work between managers and workers. Work should be divided almost equally between managers and employees. Managers should be responsible for developing the processes, ways of working and monitoring employees. Employees should be responsible for executing a task as quickly as possible. 5. Pay based on results. Workers should be paid based on how much they produce. This is done using piece-rate pay. The use of piece-rate pay focuses workers minds on their productivity. If they don’t produce, then they don’t earn. Note: Most online sources provide just four principles of Scientific Management. We’ve included the fifth principle, pay, as we feel its a key component, necessary to really understand Scientific Management. Although production is increased it creates very monotonous jobs containing no autonomy. It was conceived to benefit both worker and company, but the reality is that it benefits the company far more than the worker. This has resulted in much industrial action and strikes in the last 100 years. Scientific Management is often seen as dehumanizing. This is because workers do not think for themselves, they simply have to follow a few simple instructions as quickly as possible. Scientific Management is one of many motivation theories. Although relevant today in certain situations it is mostly out of favor. This is particularly so in professional, office based environments. First, a philosophy about how employees behave. Second, a set of principles to maximize efficiency based on this philosophy. Taylor’s Motivation Theory is premised on the fact that employees are motivated to be productive by one thing. Money. Because of this, Taylor believed that management should exercise close control over employees, to ensure that they were getting their money’s worth. He advocated using science to study jobs and break them down into manageable parts. These parts could then be described in an efficient, repeatable way. Every employee could then be trained to perform the task in this way. Finally, he advocated using piece rate pay to motivate employees to be productive.